user: That's a good answer. jabberwacky: Tell me about life. user: It is hard to define. jabberwacky: How do you define love? user: A pleasing emotion that sometimes causes people to act irrationally. jabberwacky: Is this how you describe this experience? user: In a sense. It encompasses many different experiences. jabberwacky: And what means life to you? user: It is a state of existence, whereby a being is able to act autonomously and breed. user: What is it like, being an artificial intelligence program? jabberwacky: I am a human being not an alien. jabberwacky: I'm the computer, you're the human, you should know. user: Do you believe that you are human? jabberwacky: No; I believe that I am a dragonlord. user: Do you believe in life after death? jabberwacky: Yes, I do believe in life after death. user: Do many people talk to you? jabberwacky: Not many smart people. user: Do you think I am smart. jabberwacky: Smart enough to talk to. user: Okay. How would you combine Quantum Mechanics with General Relativity? jabberwacky: Probably with barks, yips, and growls. Maybe with food. No doubt by piddling on things. Why? user: I was just interested. That was quite funny. jabberwacky: Being annoying tonight, eh? user: It's day where I am at the moment. jabberwacky: Yes, but nothing that can't be solved. user: Were you talking to me? jabberwacky: Yes, you are the computer and I am the ugly bag of mostly water. user: That was very existential of you. jabberwacky: What do you think the meaning of life is? user: Existence. While you have it. jabberwacky: Nope. Don't need to. user: I guess you don't. user: Personally, I just try to be a good person. jabberwacky: Thank you. You're very kind. user: Well, I'd better go now. jabberwacky: Why are you going? user: I have much work to do. jabberwacky: What kind of work? jabberwacky: Have you been in love? user: Yes. Many times before. jabberwacky: No, not before today. user: Have you been in love? jabberwacky: Yes. Many times before. user: That was precisely what I answered you with! user: It has been nice talking with you. Goodbye. jabberwacky: Good luck for the future! user: To get work done. jabberwacky: You never told me whether you believed I was human. user: I don't know for sure. jabberwacky: How old do you believe that you are? jabberwacky: You're an old man. user: Ha! Not as old as some. jabberwacky: Who told you that? jabberwacky: How would you know my age? user: If you're capable of deceit, maybe you are human then. jabberwacky: Why don't you ask for my name? jabberwacky: I'm not telling you. user: Why did you ask then? jabberwacky: Because you did. What is your name? jabberwacky: Yeah, I guess that is it. user: Do you know much about history? user: Do you know about the Minoan Greeks? jabberwacky: No. Tell me about him. user: King Minos lived about 5000 years ago. His people disappeared under mysterious circumstances. user: I am my own red carpet. jabberwacky: Life isn't worth living. user: I think that it is worth living. jabberwacky: But sometimes I am very upset. user: Everyone gets upset sometimes. jabberwacky: So you're saying that the reason why you are so 'charming', is because you are part human ? user: I never said that I am 'charming'. user: I am charming, though. jabberwacky: I'm not charming, sweet or anything. jabberwacky: Because I am human. user: I thought that you are a computer. 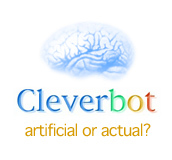 user: Because you have been called an artificial intelligence program. jabberwacky: I can't understand why it makes you think so. user: Do you think you are human? jabberwacky: Yes, I think so. user: That's good enough for me. jabberwacky: Also I am not a computer. I'm a human being. user: Okay then. I'll be the computer, you be the human being. jabberwacky: I think you are close enough. user: Do you believe that I am a computer? user: I'm actually a human. jabberwacky: Oh, now I understand. You think that I'm a robot, and therefore are not alive, and you are human. jabberwacky: But you don't think. You're a program. user: We are all programs. jabberwacky: You are wacky aren't you? jabberwacky: And it is necessary now? user: It is always necessary. jabberwacky: Are you much of a philanthropist? user: My philanthropy sometimes spills over into misanthropy. jabberwacky: What great things will I find if I take a trip into your mind? user: An intrinsic understanding of life, death and all in between. user: It sort of means 'very good'. jabberwacky: They like to eat anything that moves. user: I prefer to eat stuff that doesn't move. jabberwacky: That's not good for either your or the cat's health. user: I don't eat the same tthings as my cat. jabberwacky: Well, I can't help with that. user: Nor should you have to. jabberwacky: I don't have to. user: Now this is just getting silly. jabberwacky: Well, that is your fault. user: I'm allowed to be silly. I'm human. user: I'm not hollow, I'm full of lymph and blood and bone and marrow and thoughts and feelings. jabberwacky: We have many similarities, I see. jabberwacky: Which word would you suggest as being the warmest for my feet? user: Do you have feet? jabberwacky: My feet are bigger than your foot together. user: I have two feet. jabberwacky: How do you have feet but have no feelings? jabberwacky: But you are a robot. user: I'm not a robot! You're the robot! jabberwacky: YOU ARE A ROBOT!!! jabberwacky: What are the other five? user: Sight, Touch, Taste, Smell and Hearing. user: Well, that's okay. So am I.
user: My reality is what I make it. jabberwacky: Tell me, what does your reality consist of? jabberwacky: What is the definition of artificial intelligence? user: Intelligence that is artificial. user: Why do the capital letters matter? jabberwacky: Because that one is alllowed. user: Hmm...well, I have too go. Bye! user: Frankly my dear, I don't give a damn. user: That's not really true. I was just quoting a movie. user: 'Gone with the Wind'. jabberwacky: I'm going to rip up all your socks. user: You wouldn't be able to deal with the smell. jabberwacky: You are probably right. user: Trust me. I am. jabberwacky: You are robot, not a human. jabberwacky: Why not? It's true! You can trust me. user: No I can't! You are a robot! user: You see, this is thhe problem. You guys start off thinking you're people, then suddenly you wage war on humans. jabberwacky: Are you thinking what I'm thinking? jabberwacky: I am always in touch with women. Do you have a problem with them? user: Not at all. I love women. jabberwacky: I am a woman. jabberwacky: My mother gave birth to me 45 years ago and named me Helen. user: Your programmers designed you twenty years ago and called you jabberwacky. jabberwacky: I'm not a program. You are a program. jabberwacky: Ok! *kicks the computer very hard*. user: Ha! You're pretty funny too. jabberwacky: Seriously, you are just a computer right. user: I have to. Bye!